Blowout Sale! Free Shipping Included! 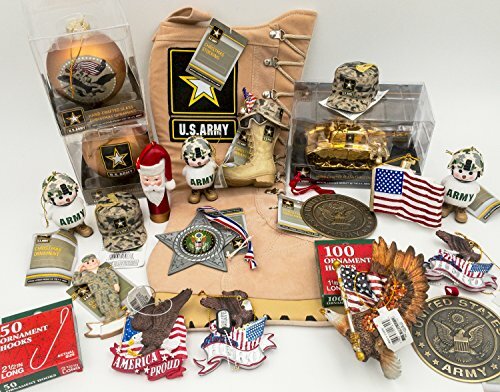 Save 55% on the JZ Bundles Large Set - Army - Kurt Adler - 22-Piece Bundle - A Bundle of Christmas Ornaments Great Gift by JZ Bundles at Two Clock. Hurry! Limited time offer. Offer valid only while supplies last. 22-Piece JZ Bundle Includes: * ''Grab Bag'' (3 of 2) of ''America Proud''/''Hero'' Ornaments, 2 Assorted * 3 of U.S. ArmyTM Snowman Ornament * 2 of U.S.
JZ Bundles the BEST for LESS! If you have any questions about this product by JZ Bundles, contact us by completing and submitting the form below. If you are looking for a specif part number, please include it with your message.